A collective presence, voice and strength of women within the structure of our Congregation. 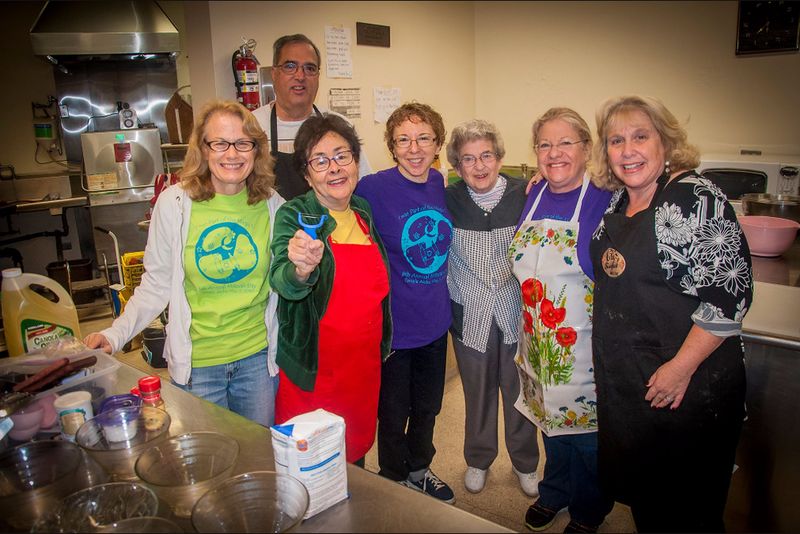 SISTERHOOD is the organization of women from our congregation who come together in friendship to benefit our Temple, the Jewish community and beyond. Sisterhood is the collective presence, voice and strength of women within the structure of our Congregation. It provides the setting in which its members meet and work together to foster and further the highest ideals of Judaism. Sisterhood works to strengthen and support Temple Akiba, with special emphasis on the support and maintenance of the youth of our Temple. Sisterhood is a member of the National Women of Reform Judaism (WRJ), the women’s affiliate of the Union for Reform Judaism (URJ). Sisterhood dues support WRJ, the YES Fund (Youth, Education and Special Projects), World Union for Progressive Judaism, and Jewish Braille International. Membership in Temple Akiba Sisterhood provides you with the opportunity to put your talents and gifts to use for many causes, both large and small. It will enrich your life as well as that of the entire congregation. Please read this letter from our president, Linda Park, speaking to our need for your support and commitment. To join Sisterhood please see the membership brochure and complete the form and return to Temple Akiba Sisterhood. We also welcome men who wish to support our programs as associate members. Sisterhood’s strong support for the youth of our Temple is demonstrated in many ways. We give gifts to the Religious and Nursery School children to celebrate Rosh Hashanah, Hanukkah, and Tu B’Shevat. Prayer books are given to the Hebrew School students and Kiddush cups to B’nai Mitzvah. Sisterhood gives Torah Commentaries to Confirmation students and has also funded donations on their behalf in the spirit of Tikkun Olam. Funds raised from the Count Your Blessings Appeal directly benefit the Religious and Nursery Schools, the Day and Resident Camps and the Youth Groups by providing funds for special programs, projects and equipment. Sisterhood contributes to the Temple membership by co-sponsoring and providing Oneg Shabbats, offering Meal of Condolence Services, giving Adult B’nai Mitzvah gifts, challahs on Yom Kippur, and annual donations to the Temple fund. Sisterhood offers many programs for its members and the general Temple community. Sisterhood members lead the service at our annual Sisterhood Havdalah Service planned with our Cantor, Lonee Frailich. We host an annual membership dinner with a renowned speaker. We offer a twice-monthly Coffee with the Clergy meeting which focuses discussions on contemporary issues affecting Jews. Every year we make latkes for the Temple’s Hanukkah Service and nursery school celebration. We sponsor a variety of special programs throughout the year to provide educational and fellowship opportunities. Past programs have included speakers such as Rabbi Joel Simonds of the Religious Action Center for Reform Judaism; Passover Outreach at a local supermarket; trips to the Skirball Cultural Center and Getty Villa; theater dates; Israeli dancing, and much more. We have a special focus on Tikkun Olam (repairing the world), offering opportunities for our members to learn and take action on efforts to improve the health the community. Examples include our work with Project Chicken Soup, Hats for Life, and support for the Venice Family Clinic, including the Cooking with Kids program. Along with membership dues, fundraising, which includes offering various services to congregants, provides Sisterhood with the means to accomplish our goals. We offer catering services for Oneg Shabbats and Extended Kiddushes. If you are celebrating a simcha, you can share your joy by sponsoring a Friday night Oneg Shabbat. Contact Linda Park at (310)836-1218 for details. Sending a Sisterhood Tribute Care is a great way to recognize someone special while supporting Sisterhood. The cards are available at a minimum donation of $3 each, but any additional donation amount is always appreciated. You can contact Ellen August at (310) 837-8811 for assistance. Our gift shop sells Judaica items, including jewelry, for all the holidays and simchas. Only a portion of our available items are on display in the Temple foyer. For assistance with gift shop needs, appointments can be arranged by contacting Linda Park at (310)836-1218. At our annual Hanukkah Boutique a large inventory is made available in the Social Hall for all your holiday shopping needs. Other fundraising efforts include our popular annual Purim Bake Sale and Mah Jongg Tournaments held twice a year. For more information about Sisterhood, contact the Temple Akiba Office at (310) 398-5783 or email Sisterhood President Linda Park at mommylinda50@hotmail.com.